As Washington Governor Jay Inslee put pen to paper and gave WSU the authority to create its own medical school, state Sen. Michael Baumgartner—a WSU alum—began an impromptu version of the Cougar fight song. A few people in the crowd circling the governor joined him while WSU President Elson S. Floyd stepped forward to shake Inslee’s hand. 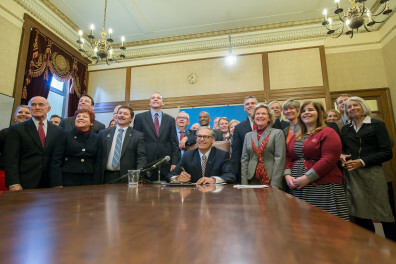 The bill the governor signed was simple in its scope. It essentially adds one sentence to a 1917 state law that gave the University of Washington exclusive rights to offer public medical education in the state. There was no money attached to the bill. Still, the process of building support for, and passing it, was not an easy one and it represents one small and important step toward alleviating a physician shortage in parts of rural Washington. It’s been about a year since Floyd and WSU Spokane Chancellor Lisa Brown told Spokane business and medical leaders that the University was interested in creating its own medical school, in addition to continuing in its role as an affiliate of the University of Washington’s WWAMI (Washington Wyoming Alaska Montana Idaho) medical education program. The University hired the consulting firm MGT of America to study the feasibility of a WSU College of Medicine. Its report released last summer concluded the University has the tools and experience it needs to operate its own medical school. With study in hand, Floyd, Brown and College of Medical Sciences Acting Dean Ken Roberts asked the Board of Regents in September for permission to pursue a medical school. The Regents endorsed the proposal. Before WSU could create a new College of Medicine, the University needed the legislature to change that 98-year-old state law. Washington needs more doctors, especially in rural areas. The state’s population has grown, but the number of medical students trained in the state’s publicly-funded institutions has remained flat during the last few decades. With the Affordable Care Act giving more people the opportunity to buy insurance, there’s more demand for care. Nurse practitioners and physician assistants are filling some of that demand, but not all. Many patients, especially older people in fragile health, are looking for doctors who are accepting new patients and having a hard time finding them. The physician workforce in Washington is aging. Doctors are leaving at a faster rate than they can be replaced. 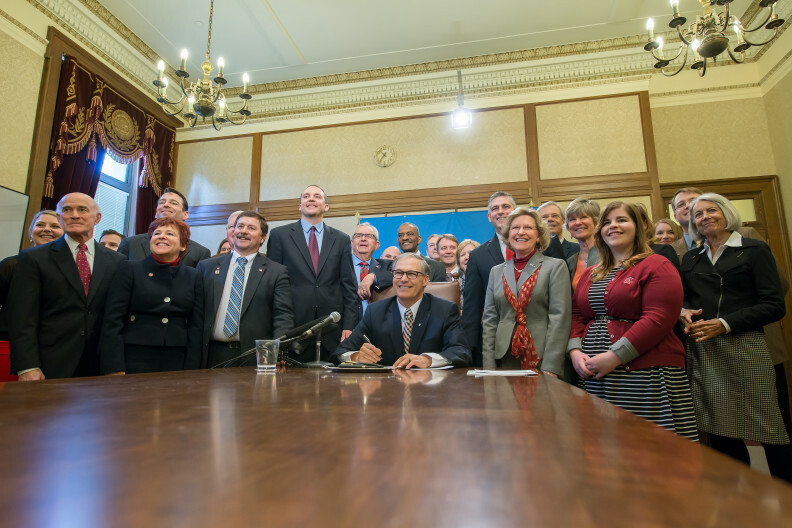 With the governor’s signature on the bill, the next step is funding. WSU has asked lawmakers for $2.5 million over the next two years to begin the accreditation process for the new school. Meanwhile, Roberts and his administrative team have begun the work of creating a medical school. They are identifying and developing the curriculum they plan to teach. They are working to create the infrastructure for a WSU College of Medicine, including the support systems students will need. They are also talking with potential partners who would teach third- and fourth-year medical students in clinical settings in Spokane, the Tri-Cities, Vancouver and Everett, where WSU has established branch campuses. The excitement that led to the singing of the Cougar fight song in the governor’s office has spread. Potential students from as near as Spokane and as far away as Pakistan have begun asking questions about when they can apply for admission. WSU can’t begin recruiting or admitting students until it attains a certain level of accreditation. That’s not expected until at least next year. But for those who dream about attending medical school in Spokane and perhaps careers as physicians in small Northwest communities, the opportunity may not be far away.